Recently I made an order at MorpheBrushes.com and I got a bunch of stuff - palettes and brushes. I now own a total of three of their 35-shadows palettes (35O, 35T, 35W reviews I did for each palette will be linked) and one 12-shadows palette - 12S Soul of Summer. I might get one more - the 12NB Natural Beauty, which looks gorgeous and a perfect day to day neutral palette. By the way, these are available on Beauty Bay, which is a nice website that offers free shipping to Singapore on orders over S$30. 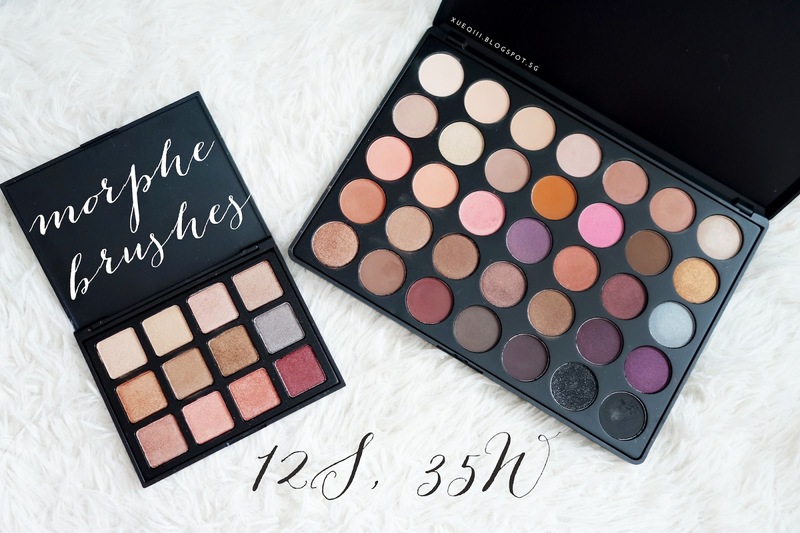 Shades and Formula - Their 35-shadows palettes has a ton of variety and you are bound to find something that you like from taupes to purples to cool greys to super warm oranges and bright colorful shades. They even have a full matte palette. To be completely honest, not all the shadows are of the same quality, some can be really patchy and powdery with little pigmentation whereas a few of them are pigmented and metallic! Overall I do think the palettes are worth the price as you get a bang for your buck. As for the 12-shadows palettes, the one that I own is the 12S, it has quite consistent quality throughout and shadows are pigmented when swatched. However I did realize that some shades are not as pigmented on the eyes, so you do have to pack them on and I would recommend try spritzing your brush with MAC Fix+ (or eyedrops), that will help with the intensity of the shadow. Price - Large 35 palettes are priced at at US$19.99 - 22.99. Smaller 12 -shadows palettes are at US$14.99 each. Firstly, let take a look at the 12S Soul of Summer Palette. Close up shots taken under sunlight and flash. All the shades in this palette is metallic and shimmery. No mattes. I love how small and compact this palette this, definitely a travel friendly one! Row 1 has two pale golden shades and another two champagne shades. Row 2 has a neutral gold and two browns and a super cool grey with just a slight purple undertone. Row 3 is my favourite row, with all copper, rose gold and burgundy shades that I am super into at this moment. Now, the 35W Warm Palette. 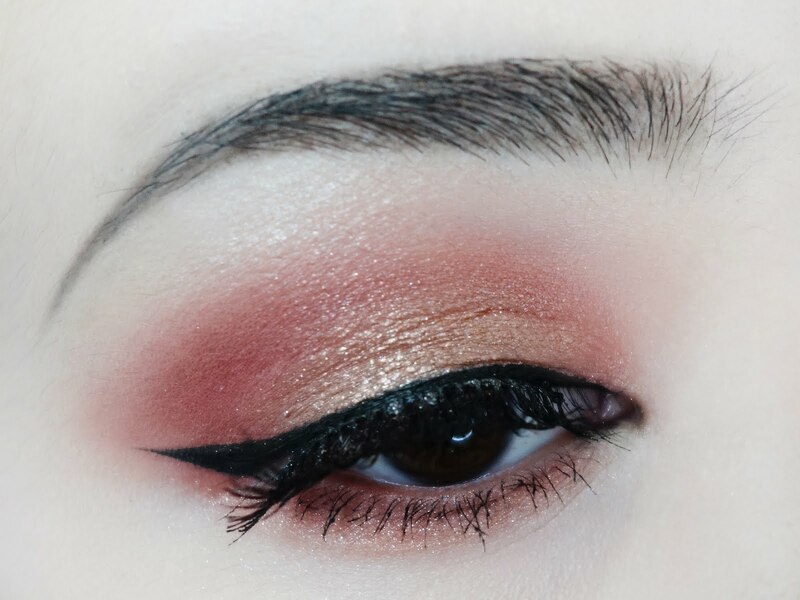 This has a good mix of mattes and shimmers. Morphe has a full matte version of this palette called 35N. I will be letting this palette go as most of the shades in here are not impressive and I do not see myself reaching for this at all. You can tell from the swatches that most of the matte shades are really patchy and sheer. I had to pack on the swatches to get the colour to show up. This palette in my opinion is not worth your money. I do enjoy my 35T and 35O slightly more. Those are better options if you want to get a cheap makeup palette. Row 1 consists of mainly lighter cream and beige shades with the first three matte shades and the remaining has a satin finish. Row 2 has three matte shades being both the cool light browns and the orange. The rest has a mix of satin and shimmery finish. Aside from the nice blending matte shades, I really like the first and last shade on the lids. Row 3 is quite a colourful one, with two orange shades, pinks, purples, a super cool silver grey and browns. All the shades has a sheen to it aside from the second pale orange - which looks more matte. Row 4 has a mix of cool and warm browns with two pops of purple. Row 5 has mostly matte shades that are perfect to achieve that deep smokey eye or just as a soft liner. My favourite shade is the first metallic brown and the third matte warm darker brown shade. Let me know what type of looks will be interesting to do with these palettes! I will definitely be playing around with these more and try to come up with a look or two. Stay tuned.